Hi again, Sorry for emailing again, but I thought you might find some photos useful. Hi there! I am very new to this, so first I'd like to thank you for your great website, I've been learning a lot by reading through! I'm writing about my comet goldfish who had some problems for about three months now. Here is my set up: I have a 45 Gallons tank, it is planted, has rocks and pebbles of various size, and two pieces of driftwood. The cycle has been established (and the fish then introduced) for 6 months now, and the water parameters have been stable to ammonia 0, nitrites 0, nitrates between 10-20, ph 7.2, temperature around 20C (I don't have a heater, so it's room temperature). There are 4 filters in the tank (2 small ones from my previous tank, both around 120L/hour - I put them there to help the tank cycle and left them there - and 2 bigger ones, a Fluval C4 and a powerhead which is connected to an airpump and which circulates a "river manifold" in half of the tank, so it also acts as a filter). I perform regular water changes, 30% every week, and I test the water every week. I have had the goldfish for a year now (in another tank for the first 6 months), so he is still pretty young and only 3 inches. Along with him in the tank I have 3 white cloud minnows, 2 Hillstream loaches (Gastromyzon scitulus) (which is why I have a river-like tank), and a tiny snail of unknown coldwater specie (I used to have a bigger one, but the goldfish ate him last week). I feed them blanched greens alternating between kale, broccoli, lettuce, green peas, cavolo nero (I try to feed greens regularly, almost every day or every other day), and alternate goldfish pellets, Spirulina pellets, goldfish flakes, and give bloodworm and daphnia as an occasional treat. The goldfish poop has been looking not so good for about a month, the consistency is right but about half the time it's greyish/whitish (the rest of the time it's the colour of what he eats). So here is the main problem: For the past 3 months my comet has been developing a bump on his left side (the scales don't raise, it starts without sharp shape, about the size of a grain of rice but smooth under the skin and no colour difference with the rest of the skin); after few days the bump becomes more defined and localized, the edges sharper and rounder, but still no scales raised or colour gradient/difference with usual scales; then after few more days it progressively protrudes out to a white eruption (really like a zit), then bursts, letting the white come out, and then heals very quickly, as if nothing happened. From the time it appears to the time it explodes it takes exactly 7 days. This has happened 3 times so far (so about once a month), always on his left side, about in the same place, but not exactly. The zit doesn't move once it starts forming, and gets to a maximal size that is smaller than his eye. One started forming again 3 days ago, but I've just noticed there are actually two bumps about 1cm apart now. He doesn't seem to mind at all (except at the moment when it burst, when he flashes for few minutes, but that's it), he is very energetic and eats well, he is super curious (he goes crazy at me every time I get close to the tank, which makes it hard to take a photo). The rest of the fish are really doing great, for now. I've tried to read online, but I just managed to confuse myself. From what I understand it could go from bacterial infection, to viral infection or some protozoan parasite. From what I got, using aquarium salt would probably be a good start, but I wanted to check what your opinion is before doing anything. If it's parasites I should probably treat the whole tank rather than set up a hospital tank (right now the only extra thing I have left is a 12-litter tank...)? If I do use salt, what should I expect to see as improvements? Should the zit not burst? Should I wait for the present zits to burst and then add the salt and hope it doesn't come back? Thanks a lot for your help, and please let me know if you need any extra information. Hi Bob, Thanks a lot for your answer. Actually, that's also what I thought the first time it happened, that he had just injured himself somewhere and that the "zit" was just going to burst by itself. I was really reassured when that happened after 7 days and there was no scar, no redness, no inflammation left. I checked for causes in the tank and I'm pretty sure everything is really smooth. I removed a plastic decoration I think he was hurting himself on the first day it happened, 3 months ago. I used sand paper on the driftwood to make it baby smooth, and the pebbles are really smooth. there are no caves he is small enough to get in, even if he tried. I removed all the plastic plants I had in the previous tank (he used to tear his tail on them) and only have real plants now. But then it came back and a new bump grew about three weeks later, and it burst again and disappeared, again. Now the ones he has are the 4th, and the thing I find suspicious is how the timing is so regular. From the time the bump appears till the time it's gone, it aways takes 7 days. Tonight one of the two zit just burst. I isolated him when that happened (it took about 15 min altogether), so the white stuff doesn't go in the tank water. That also allowed me to take clearer pictures videos (sorry I'm not very good at that). 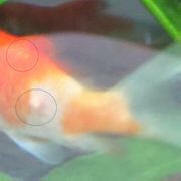 Once the cyst exploded, as before it left no trace on the fish. 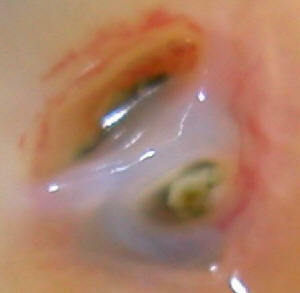 The skin ruptures under the scales and the while stuff gets expelled, but no scar or round hole is left behind. The scales go back on the skin and there is not even any redness. It remains a bit inflated for about 12 hours and then there is no trace of anything left. Maybe under the light, the reflection on the scales is a bit uneven, so it's possible to see that something happened by trying really hard. The white stuff comes out as a pocket about the size of a scale, and once it is expelled it breaks down into tiny white dots as it comes out. I don't have a microscope, but they are less than 1mm in diameter, about as big as the diameter of a human hair, so that would make them about 60-100 micrometers. They don't stick together, but some (very few) do congregate with what looks like 2-3mm-long, barely visible filaments (maybe from the "pocket" that held them together under the skin?). 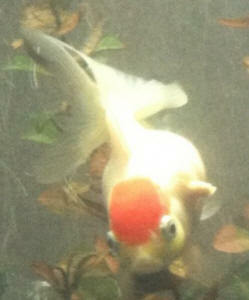 For a little over two weeks I have been searching for an answer to my fantail red cap goldfish's problem. I have been communicating with several moderators of goldfish forums and all seem to be stumped. One very experienced goldfish moderator suggested I email you. I fear it is Glugea now and I feel horrible for keeping her with her goldfish tankmate all this time. Her tankmate (just one calico fancy goldfish) shows no signs of illness. and ammonia and nitrites 0, nitrates are kept under 20-40ppm. I use Prime to condition my water. Her symptoms are as follows: bloated body (more on one side than the other), PopEye, yellow face, and the most disturbing is bumps that have been developing and bursting right under the scale, releasing solid white chunks with no blood and not leaving any wound or red marks. She has become increasing bloated and now seems to prefer the back of the tank. She is still eating and swimming and until very recently seemed to act completely normal (digging up my plants, social, etc. How I have treated her: she has been on Medi-gold sine June 11th. On June 18th I dosed the tank with Prazi, fearing flukes. Five days ago I started adding .1% aquarium salt to the tank. Yesterday, I dosed the tank with Melafix. I live over two hours from the closest marine vet - but a neighbor of ours who is a vet (doesn't treat fish) saw her and suggested Melafix. Thank you in advance for helping me! I should move this to 1x/week 30%? I am assuming I should try to lower the pH with a pH lowering chemical? And I should stop feeding the Medi-Gold? Immediately? Or Tuesday when they have reached their 14 days? 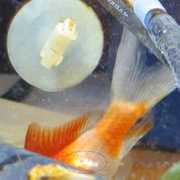 I have 2 fairly large Golden Fantail Fish that are 7+ years old. One of them has a huge growth on its right side in front of its tail. It doesn't seem to be in pain, is always ready to eat, swims around with the other fish and appears normal except for this hideous, lumpy growth. The tumor (growth) has been growing for months but the fish seems unbothered by it. Your #16 pictures a fish depicts the closest likeness to the same type of affliction. If I understood correctly your suggestion was to use a single edge razor blade to remove the growth and then seal with super glue. 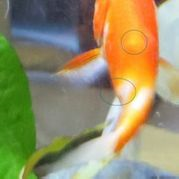 How can one remove the lump from a floundering, gasping fish or did I misunderstand? <The ONLY way to do this - ONLY, mind you - is to anesthetize the animal first. Do NOT try to carve a chunk off a conscious, flopping fish, or you'll more likely carve into something much more important than the unsightly growth. Although you can use MS-222 (Tricaine) or (less ideally) clove oil to anesthetize a fish, you must understand that undertaking something like this is not without risk. 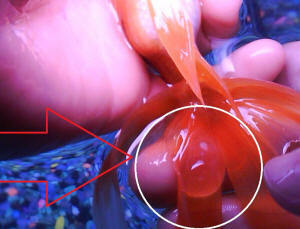 To be quite honest, if the fish is not bothered by this growth, you might be better off leaving it alone. Thank you so much for such a rapid response. You and your website are amazing. I just can't euthanize him or attempt surgery if he's not particularly bothered. If it continues to grow at the rate it has been euthanasia may become a necessity. I really love the pair but don't want either of them to be suffering. No other fish have made it for this length of time except the plecostomus who is now at least 10 years old. I plan to revisit your website when time permits. Thanks again. <And a very happy holiday season to you and your beautiful pets! 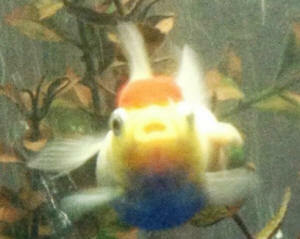 I have searched the web, including WWM, and have not found anything quite pertinent to my goldfish's malady. The fish's name is Wanda and she is a common type won by my daughter at a fair four years ago. She is about six inches long and until three days ago seemingly quite healthy. She shares a 75 gallon tank with one other goldfish, a rhino Pleco and few smaller fish. I have a 400 GPH HOT filter with dual BioWheels plus two 350 GPH canister filters running all the time, one with a micron filter, the other carbon. I do a one-third water change every week or two. The tank is partially planted, consuming nitrates, and some Nerite snails and freshwater clams keep the gravel pretty clean. I use water from the softener at pH 8.3, KH 8+ and GH, of course, zero due to the softener. So back to Wanda ... three days ago I noticed that one of her (I actually do not know her gender, but my kids gave her a girl's name, so we refer to her as if she were a her) nostrils was slightly swollen with some black discoloration inside. Within a day this condition worsened so that it is now quite a pronounced swelling. The nostril is gaping on both sides of what appears to be a septum. She also has a scale or two loose on one side, uncertain of the relevance. Last night I carefully applied Mecuriclear to the nostril as a prophylaxis for secondary bacterial infection. No way to tell if that did any good. This afternoon I moved her into a ten gallon quarantine tank with 5 tsp aquarium salt and one dose each of Fungus Guard and General Cure, hoping to wipe out any bacterial, fungal or parasitic pathogens. She was acting fine, swimming and eating normally ... at least until I incarcerated her in that little 10 gallon tank ... she is not happy now! Bouncing off the walls. Any ideas? Suggestions? Wanna see a photo? Thanks, David, for the response! 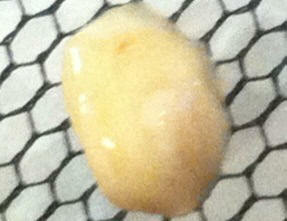 Attached are photos of the inflamed nostril taken Friday afternoon, 24 hours into quarantine. The swelling seems reduced about 25% and the redness also. Yesterday I moved into a 40 gallon breeder similarly medicated. She immediately calmed down and is swimming like a goldfish again. With a 40g to herself, I figure she's got a bigger share of litter in her box than in the 75g with two other big fish. I just measured nitrates in the 75g, with no water changes since moving her out, at 40 ppm. Ammonia and nitrites both zero. I am a 10 year old girl with a fancy tailed goldfish named Buddy! I have had him for almost half of my life, which means his 5 birthday is coming soon well I mean (day i got him I really don't know when his birthday is) Anyway my problem is about a year ago he started to get this thingy near his back side and it was hard to tell what it was or even what it looked like. Now its huge. I have checked out many goldfish books but nothing I have found looks like Buddy's booboo. It kinda looks like people skin. It doesn't really seem to bother him other then it is attached to 2 or 3 of his tails and it also weights him down when he tries to go under things at a funny angle. Its now showing a small spot of what I think is blood at the closes to his body side of the booboo. My mom also pointed out that he has some red lines on his tail. Im sending a picture so that hopefully you can help buddy and me out. Thanks Maria and Buddy. Hi... I'm having terrible fishsues ( issues with my fish)! You have been my last resort... I have gone to every site available about goldfish diseases and nothing has been solving my problem. If there is any advice at all you could give me, that would be great. My Oranda has a bubble like sack on its dorsal fin, that may or may not be filled with fluid and it moves as the fish swims. It's been there for about a month and the fish hasn't had any other symptoms. I picked it up when it first appeared to examine it closer and the sack popped and came back the next morning. The bubble is about the size of my thumb now and I have no idea what to do. Thanks for listening. 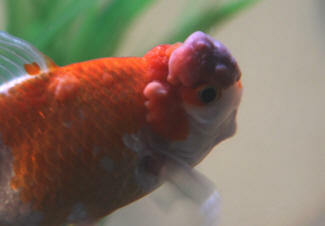 Our seven year old goldfish has skin cancer. It does not appear to be impaired by the cancer; it can swim and eat normally and does not rub against the side of our tank. How can I tell if this fish is in pain or distress? I want to care for it as long as doing so is humane. I am not sure what to do now, nor am I sure what to do next.